Where do you place the hyphen in "Beethoven" if it breaks between two lines? How do you cite John Coltrane’s album A Love Supreme? Is it "premiere" or "première"? The answers and much more can be found in this definitive resource for authors, students, editors, concert producers—anyone who deals with music in print. Extending the principles devised for the classical repertoires, this revised and expanded edition now includes examples from world music, rock, jazz, popular music, and cinema. This essential volume covers some of the thorniest issues of musical discourse: how to go about describing musical works and procedures in prose, the rules for citations in notes and bibliography, and proper preparation of such materials as musical examples, tables, and illustrations. One section discusses program notes, while others explain the requirements for submitting manuscripts and electronic files, and outline best practices for student writers. An appendix lists common problem words. Updates include greatly simplified citations of Internet locators, the recognition of multiple platforms, and the expectation of paperless transmission and storage of work. 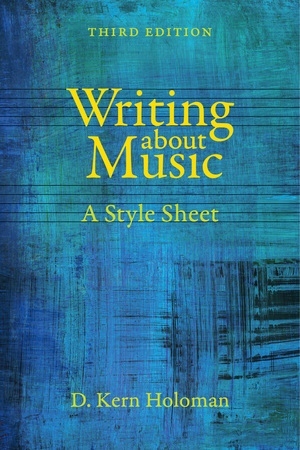 Cited as the authority by The Chicago Manual of Style, this classic handbook is the go-to source for anyone writing about music. D. Kern Holoman is Professor Emeritus of Music at the University of California, Davis, where he conducted the UCD Symphony Orchestra for more than three decades. He is the author of Berlioz; Evenings with the Orchestra; Masterworks; The Société des Concerts du Conservatoire, 1828–1967; Charles Munch; and The Orchestra: A Very Short Introduction.